6. Warehouses cover 1400 square meters stock hot-selling embroidery fabrics GuangZhou Guo Xin Clothing co,ltd established in 1998,which is a first-hand direct professional big manufacturer who specializes in researching , developing, designing, producing and selling Clothing/apparel/garment lace fabric accessories. Our products include more than one thousand styles such as budsilk,velvet,barcode, embroidery bead&sequin, Carbone, Decals.nylon lace fabric, cotton lace fabric, spandex lace fabric, polyester lace fabric, brushed lace fabric, metallic lace fabric, bubble lace fabric, fashion swiss lace fabric, embroideried lace fabric, printed lace fabric, jacquard lace fabric, eyelash lace fabric, crochet lace fabric, lace fabric trimming. Our lace fabrics are widely used in garment, wedding dress, evening dress, lingerie, underwear, nightwear, body shaping and ladies fashion, socks, curtains, bedding items and home textile, etc. the products have special features; can waterproof,anti-mildew, anti-rust&corrusion&fade , abrasion-resistant and durable. We have several beaded factories in China(mainland). 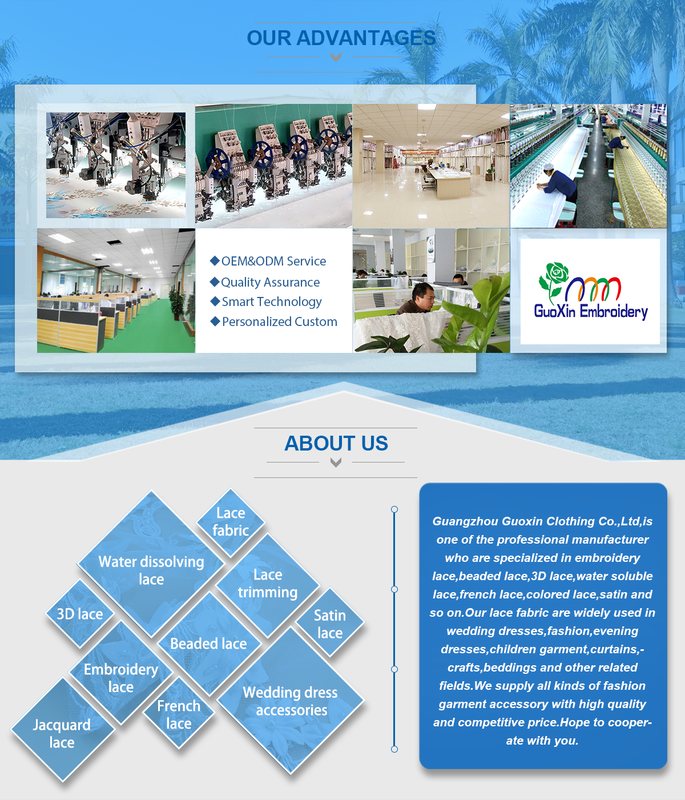 And in each one we have talented staff, excellent designer who can grasp the fashion by their professional sense, use the best equipment operated by mature skillful workers, strict quality control system. Create a sense of quality and taste. We offer multiple trade service to our customers with the expert's quality and professional level. And we also succeed in obtaining recognition and support from our international customers and competitors by keeping improving and cordial and humanized services, so our factory is becoming more and more prosperous. Our textile fabrics are exported to many different countries and regions.we also can accept orders according to your requirments and samples you show us.You can also visit our store and factory to get more information. We'll give you competitive price and best service. 3. Keeping pace with international fashion frontier. 2. 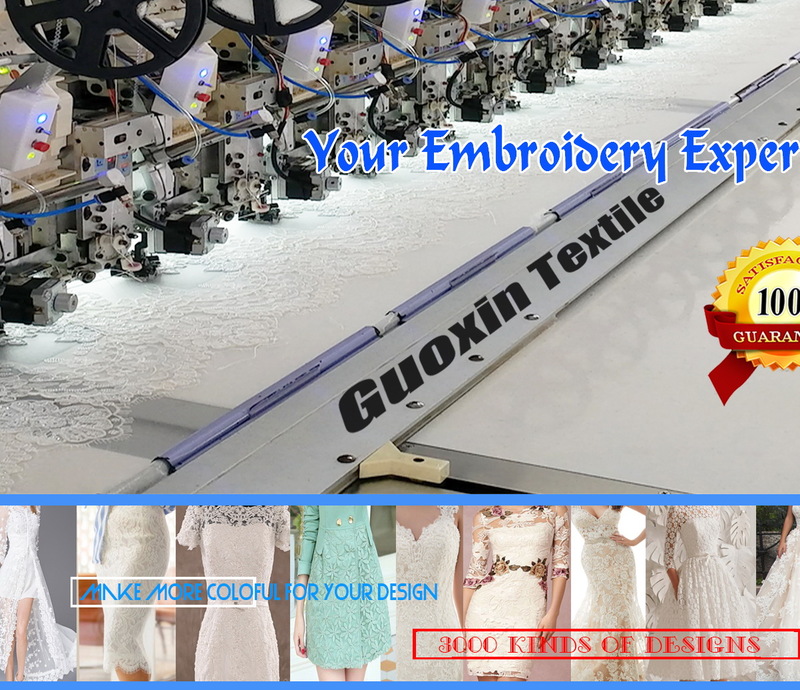 Main products: All kinds of computer Embroidery fabrics like chemical lace, rayon ,polyester, cotton, bud silk, spandex lycra, sequin embroidery fabric, coiling fabric, organza fabric, trimming lace, etc. 6. Strict in-house QC to ensure the quality. 8. Bulk lead time: 10-15 days generally, but should according to qty, color and our production schedule. 10. We send shipping samples to customers to check the quality before delivery. Welcome customers to check all the bulk quantity goods before shipping. 11. Customized design and color would be welcome. We can make free samples for you if you give us the clear design pictures or original samples. Welcome to visit our factory and looking forward to cooperate with you!